Get married in the beautiful South Pacific with our Signature Fiji wedding package. You’ll spend seven nights at the spectacular Likuliku Lagoon Resort, located in the castaway Mamanuca Island chain. Return transfers to the resort are included, along with meals, your wedding package, tropical flower garlands and French champagne. All you need to do is show up and enjoy your special day! Take your vows overlooking the turquoise lagoon before enjoying a week of total relaxation at this five-star boutique island resort. After your wedding, spend time relaxing in your Garden Beachfront Bure at Likuliku. 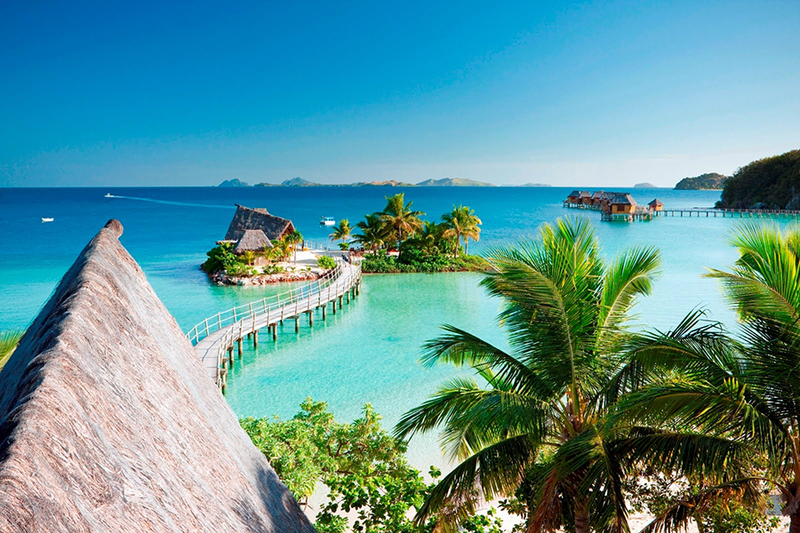 If you want to explore further we can help to arrange an island-hopping honeymoon through the rest of Fiji or even create a multi-country adventure featuring destinations such as Australia, New Zealand or the USA! Questions? We've got them covered. Take a look at our FAQs about getting married in Fiji. Our Signature Fiji wedding package is designed to give you an idea of what is possible. Everything can be tailor-made to suit your personal needs. Please contact us by email or give us a call on 01273 964 035 to get started. Fiji’s wet season runs from November to April, with the heaviest rains and highest humidity from December to mid-April. The dry season begins in May and lasts until October, with low rainfall, low humidity and milder temperatures. Peak tourist season in Fiji coincides with the Australian and Kiwi school holidays from December to January, and June to July. Resort prices are considerably higher over these periods. Our Fiji wedding package is purely a suggestion and can be tailor-made to your personal requirements, so please contact us and we’ll put together a bespoke quotation for you. Marau Wedding Package including traditional floral lei (garlands), flower decorations, French Champagne on arrival, registration and document fee, ceremony set-up, minister/celebrant and framed wedding certificate.